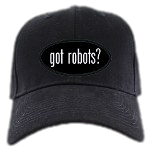 Welcome to gotorobots.com, the online showcase for Nick Donaldson's robots. Here you can find pictures, video and information on some of the many robots that Nick has built over the years. onesies and much more online at Café Press.